After standing unused for over 30 years, and closed to the public, SC Johnson Company's Frank Lloyd Wright designed Research Tower will open for tours. SC Johnson Company has announced that the tower, one of the tallest cantilevered buildings in the United States, will be a part of the public tours for the first time ever. In a copyrighted story by Milwaukee's Fox 6 News, free tours of the tower and the administration building will begin May 2, 2014. SC Johnson has restored two of the 15 floors to their appearance when the tower was closed. Period equipment has been placed to enhance work space mock-ups. The tower has 15 cantilevered floors, six are square with circular mezzanine floors above them. (There is an additional square floor on the second level.) All the floors are supported by a central core, none are supported by the exterior walls or any additional framing. The core contains an elevator and a circular stairway that is a fire inspector's nightmare. After restoration of the exterior (including cleaning the glass tubes with Windex™, an SC Johnson product) it is possible to make out the round shape of the alternating mezzanine floors. The tower opened in 1950 and was the only R&D building Wright ever designed. It was never open to the public while in use, nor after it was closed in 1983. More than 5,800 Pyrex glass tubes, totalling over 17 miles in length, serve as windows, letting in diffused light. 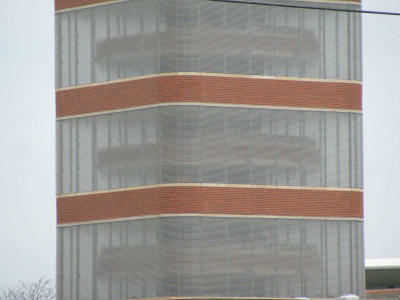 The exterior alternates between stripes of glass tubes and more than 21,000 bricks. The bricks feature the signature Wright/SC Johnson “Cherokee Red” color. Tours are free but require advance reservations. If you are interested in seeing this architectural gem, check soon for a tour opening. Tours are filling up quickly and can be made by following the link below. Chicago Tribune Article: Frank Lloyd Wright's tower worthy of debate, and a trip by Blair Kamin. Fox 6 News Story: For the first time, step inside S.C. Johnson’s research tower. SC Johnson Company Tours: SC Johnson Company Tour Reservations.